THE RECOMMENDATION: Carol garnered six Academy Award nominations including ones for Best Actress (Cate Blanchett) and Best Supporting Actress (Rooney Mara), but most feel the film was snubbed from the bigger awards like Best Picture and Best Director. Supporting this notion is the fact that Carol appeared on many year-end Top Ten lists including lots of first place finishes. I bring this up because after seeing the film, I can see where all the praise is coming from and why so many are crazy about the film. However, for my own tastes, Carol failed to grab me and immerse me in the incredibly complex, nuanced, and highly detailed world that it shows. 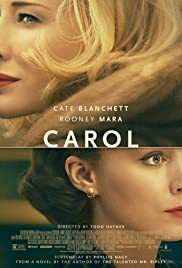 The acting is indeed superb with Carol (Cate Blanchett) and Therese (Rooney Mara) delivering excellent performances of complex characters. The story and arc from beginning to end is also fairly well-told and is a decent portrayal of a 1950s period piece. What failed for me was the pacing and getting invested in the film itself. Opening in a posh lounge with very little explained immediately had me grasping at straws. Not the fact that you are presented with many more questions than answers, but that they didn’t make the answers something I was particularly interested in discovering. Indifferent would be a good way to describe how I felt about Carol and when certain events would unfold or conflict arose, I mostly greeted it with an, “Eh, so what,” reaction. This could be a simple case of bad timing or hearing too much hype affecting (negatively) my opinion about the film and if I saw it again, or saw it under different circumstances, my opinion might change. I do see why so many people enjoy Carol and if you are one of the people who just gets the film right from the opening scene, you’ll be in for quite a treat.